Focus: How did Japanese Art influence France? When we learn about art history there is a lot of focus on Western Europe art development. We learn each style improvement and down fall they made throughout time, but there is not much focus on the Japanese art culture. This most definitely interests me because their culture is very traditional and although many changes and styles have progressed through time, they always seemed to absorb the new design style into their own unique outcome. In approximately 1860 France became aware of the Japanese style of simplicity and impressionism and adapted it into the uprising culture in the rest of the world. 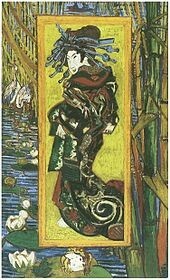 The style that the French had been influenced with was known as Japonism, which means “expression in fine arts form”. I would have never guessed that Japan was an influence on France. The style of European art was art different from Japan. European art consisted of delicate paintings that appeared truly realistic, almost angelic at times. Their art was either a representation of their personality or to portray them as something they are not. Whereas Japanese art was not concerned with portraying people exactly the way they were. Most of their art forms had an impression feel to them. Things were depicted in simple forms and colors and did not generate a realistic view (shown in figure 1). Japanese art includes a variety of media techniques that include painting, pottery, sculpting, calligraphy, wood block prints, origami and manga. Not all of these styles were adopted by France and the rest of the Western European society but painting and prints were styles that did have a major effect. The vast majority of art produced had irregular lines, curves and body shapes. It presented a sense of mystery to the posture. Rather than the person being positioned in the main center of the artwork, most pieces were made with an off balance, non-centered form. The vibrant colors were a major attraction to the paintings (shown in figure 2). The Greco-Roman art had none of these features about them which made Japonism so new and intriguing. The lack of perfection let artists interpret things the way they wanted, without being critiqued on perfection of the form, quality and coloring technique. As much as Greco-Roman art is beautiful, the Japonism’s simplicity is rather refreshing. I feel that if the Japonism style was not introduced or better yet even created then our world would have gone either two ways. People would have maintained the perfectionist style and our lives would be much more “in order” than they already are, or our world would have gotten sick of perfectionism altogether and things would be much more relaxed. It’s strange to say how much art really does affect our lives. Art radiates a sense of presence that should go with it. 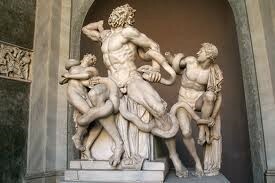 When you stand in front of a Greco-Roman art media such as the Laocoon (shown in figure 3), an emotion takes over and you can feel the emotion and pain that goes with it. It may not be angelic but it does provide a realistic view of man vs nature. The sculpture itself feels so heavy and weighted that so does your body. Now compare it to a Japanese painting “The Great Wave at Kanagawa” by Hokusai. The painting of the large wave does not pull you in close enough to make you feel like you are being drowned. The cartoonish appearance gives a light hearted sense to a horrific event. The Japonism style differs so much because it alters your perception of real life events that occur, making it easy to go about your day without your mood being altered by an image. I don’t fully know what happened after France adopted Japonism style into its culture but I do know that it was broadcast for the rest of the world to see. Unlike any other type of art, some areas of the world are more responsive to it while others hesitate for a while. Ultimately the Japanese art form was fully taken on by the world and is still a version of art in our everyday lives. Not everyone has to love the way things are painted, but it does speak to us in a very different way than Greco-Roman style does. The importance that Japanese art had on France and European society was that it created a flat plane surface rather than dimension and depth and perspective. The art form was simplistic and non realistic opposed to realistic and perfection. The color choices of Japanese art was bright, bold and vivid, while Europe was still influenced by soft, neutral pallets. I could not think of a better solution to redefining art in the European society than to go back to basics and divert off into another path. A path that leads towards something that makes our minds think of the true meaning of what is happening in the artwork. Art always has a story to tell whether it was intentional or not. It can be obvious or hidden, but sure enough it can always be found. "Culture of Japan." Wikipedia. N.p. : n.p., 2013. N. pag. Print. “Japanese Art.” Wikipedia. N.p. : n.p., 2013. N. pag. Print. “Art of Europe.” Wikipedia. N.p. : n.p., 2013. N. pag. Print. Institute. Vers. 4. Patricia Flynn, n.d. Web. 2013.